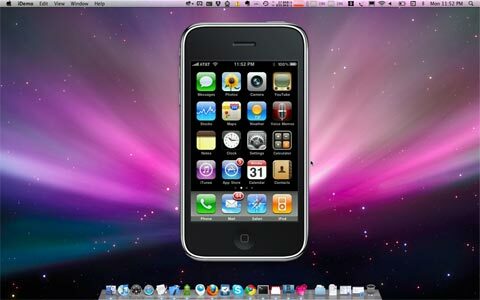 iPhoneFreakz _ All The Latest And Greatest iPhone News » iDemo V1.1.0 Mirror Your iPhone On Your Desktop Just Like The KeyNote! iDemo V1.1.0 Mirror Your iPhone On Your Desktop Just Like The KeyNote! iDemo is a tool that simplifies real-time demonstrations of iPhone apps and games. iDemo connects to your iPhone over WiFi and mirrors your iPhone screen on your desktop, in real-time – kinda like Steve Jobs during his keynote presentations. iDemo is available for Mac OS X 10.5 or higher and Windows XP Service Pack 3 or higher. You need a jailbroken iPhone running ScreenSplitr or Display Recorder. You can download a trial from Plutinsoft or purchase the full version for $14,99.